“No more!” cries Elizabeth Johnston (aka The Activist Mommy), who has made Christian activism a calling for her life and her family. 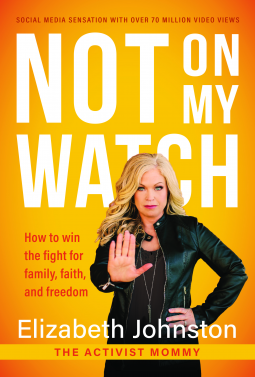 In Not on My Watch, Johnston courageously defends the timeless truths of God’s Word and inspires and encourages other Christians to unite in winning this war for our children, our morals, our freedom, and our culture. Don't mess with the Mama Bear! This book resonated with me, not because I agreed with everything the author said (I didn't), but because I agreed with her intentions and sentiment. In this rapidly-changing world, we need to stand up for what we believe in, protect our children, and try to eliminate some of the ludicrousness that is trickling down. What that looks like might be a little different for each family, but the author inspires us to take action, to quit turning the other cheek, and to remember that it's all of the future generations we are protecting at the same time. There were a couple of scientific claims made partway through the book that didn't appear to have any citations to back them up, and had me wondering how accurate they were, and this is why I am removing a star.